I admit, I’ve been on a bit of a tear about autoposting lately. The thing is, the older social media becomes, and the deeper we fall down the rabbit hole, the more people there are that want the “magic social media bullet.” I have literally had potential clients say to me “I want all the rewards of social media without having to put in the effort.” But it just doesn’t work that way. I’m a big fan of Hootsuite. I just got my certification, in fact! Which is very exciting! However, if you’re using Hootsuite (or any other third party app) to schedule your Facebook posts, you should stop. Yeah–it’s easy–you can write one update and push it to all your social media at once–BUT if you use Hootsuite to schedule your Facebook posts, Facebook will penalize you. I learned this the hard way: I had to attend a conference on Tuesday, and knew I’d be away from my computer all day. I had written a blog post, and normally, if I’m leaving the house early, I’ll go into Facebook and schedule it to post later in the day. Tuesday I was lazy or in a hurry, so I used Hootsuite to schedule the post to up on my Facebook page. When I got home that night and checked my post views, I was shocked! I had gotten less than 100! Now, for me, a post averages between 250 and 600ish views. Less than 100 was not good! I was curious as to why this was, so I started to do some research, and sure enough, it turns out that Facebook will penalize you by burying your post if you post it via a third-party app. What’s Causing the Reduction in Facebook Reach? UPDATE: so much has changed with Facebook! I don’t think the method by which you post to Facebook is as important any more as what you are posting, and when, but I’m conducting some experiments and testing some ideas and will post on them when I have some solid numbers. HERE IS THE UPDATED POST. I have long since suspected this and was about to ask how to schedule FB posts but low and behold, I thought about it a minute and figured it out – had been wondering what that little icon was! Do you need me to write a blog post on that? I figured it out once I gave it some thought but I would make a good post all the same. Until you mentioned it, i didn’t know they had a function for scheduling posts within Facebook. Yeah, it’s great! I use it ALL the time! Insightful post. However, scheduling within Facebook doesn’t always work as smoothly as one would hope. If you’re working with many accounts across many time zones, Facebook’s internal clock doesn’t always sync up correctly. It’s happened to me. I’ve tried to change it, but it seems that FB automatically detects it. Interesting! Can you say more? I’ve not experienced this problem. I understand why folks think automation is great–saves you so much time, right? But it’s impersonal. And the truth is, you’re going to get better results if you take the 30 seconds an repost your stuff to each of your social networks separately. Hi also noticed that posts from hootsuite seem to be posting them only viewable by friends and they aren’t public, it maybe a setting some where but it does that. I don’t use Hootsuite for this–I use FB’s internal scheduler. But if I were using it, I’d use it for a page, so friends are moot! Sorry–I don’t think I can help you! Thanks for the reply it was just a heads up really. I must say I have had a different chain of results over the last 8 months. 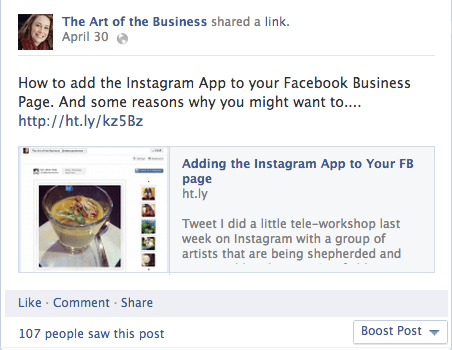 Myself and my team use hootsuite to schedule post for a number of fan pages in Facebook. We have found that we get about the same level of engagement regardless of which approach we use to post content. I look forward to any new information on this topic. Trying to manage several fan pages with automated tools is like trying to ride a bicycle with handle bars — you are going to fall down a lot and you will need excellent balance of time and dedication. I am not saying that auto scheduling allows you to be less dedicated but we spend enough time trying to find good content to keep our fans engaged. Thanks for your feedback. I wrote this post quite some time ago, long before FB’s algorithm started being so harsh! One thing I’ve been reading online is that one way to possibly make a difference is to publish more content per day. I used to be very firmly in the “one post a day is enough” camp, but now I’m perfectly fine with posting to my FB page 2-3 times per day. Hootsuite is great for this–especially with the autoschedule feature. One thing I still don’t like about Hootsuite, though, is that I can’t hit the enter key–sometimes I like to put a space between paragraphs, but as soon as you hit “enter,” it publishes the post! Agh! Did you run tests using Hootsuite and not using it? is FB still lowering your counts if u use 3rd-party apps? Dang it! I got busy doing some research on Twitter ads and have been distracted. Putting this on the to-do list! While I respect your opinion here, I’ve done many test runs between posting to Hootsuite and posting directly to Facebook and can say that there is no evidence at all to support your claims. The main aspect of the suppression of posts is sharing links, not if you are sending them from a third party app. I know that you wrote this article a couple of years ago and things may have changed, but I actually have been getting better results for HS recently. Thanks for your comment. You’re right–this post is a couple of years old, but last year, I did a follow-up post where I did a week’s worth of posting to my FB page from Hootsuite. This post was only based on one or two posts, and I wanted to do more in-depth testing. You can read those results here. But maybe it’s time to test again? While I’m bummed to learn Hootsuite is not very effective on facebook, I’m thankful you have saved me a ton of time scheduling posts that will not be seen! Do you know if the same applies for other forms of social media (i.e. Twitter, Instagram, etc.)? I don’t. But the algorithms for those networks are still so new. Hootsuite only schedules posts for Instagram, it cannot post on your behalf. Twitter–I hope not, because I use Hootsuite every day to manage and schedule my tweets! Brierf but very accurate info… Thank you for sharing this one.